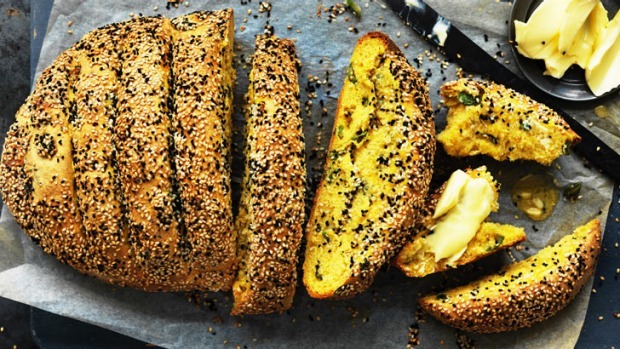 A bold little tear-and-share loaf with a golden pumpkin crumb studded with green olives. This bold little loaf can be served with soups and dips, and has a golden pumpkin crumb studded with green olives. 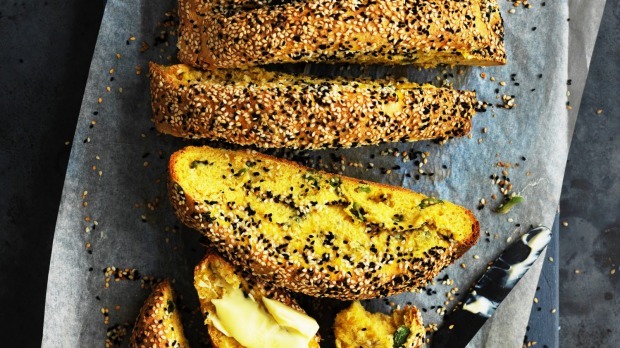 The toasted sesame top and deep cuts is a nod to Cyprus' koulouri bread, the original tear and share loaf, and a great one when you've got friends around as you can just rip into it with your hands at the table. More finger-licking food, that's what we need. 2. Knead the dough until smooth on a floured (or oiled) surface then return it to the bowl and leave for about one hour somewhere warm until risen by half. 3. Then shape the dough into a stubby baton, brush with water, roll in the mix of seeds on a dinner plate then place on a baking tray lined with non-stick paper. Leave to rise for another hour, covered. 4. Heat the oven to 200C (fan-forced), score the dough with a blunt knife or scraper every 2-3 centimetres into portions but leave it bunched up close so they stick, then bake for about 40 minutes until a deep golden colour.